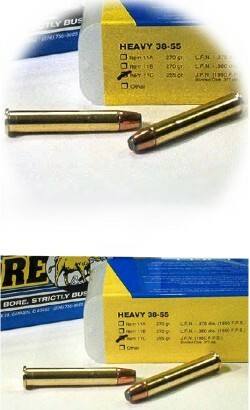 Heavy 38-55 Winchester Ammo - 255 gr. J.F.N. Bonded Core .377dia. Our 38-55 ammo is designed to work in all 38-55 chambered firearms made with modern metallurgy for smokeless powder. It operates at 38,000 CUP—the 30-30 Winchester operates at an average max. pressure of 38,500 CUP. For those who are not aware, the 30-30 case is simply a necked down 38-55 casing. 1) We get the bullet closer to the rifling’s and this creates a generally more accurate load. 2) The longer 38-55 brass, with thinner case walls than 375 Winchester brass, gives much more case capacity and this allows chamber pressures to drop immensely. i.e. 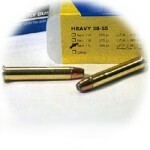 our 38-55 loads give the same performance (a 250gr. bullet @ 2000 fps) as the original 375 Winchester loading, but at only 38,000 CUP instead of the industry max. pressure of 52,000 CUP that the original 375 Winchester was rated at. The concept of using 38-55 brass to produce ammo for the 375 Winchester may be new to you, but it is not to us, so please simply read carefully and believe me. We’ve sold hundreds of thousands of rounds of this ammo and about half of it has been shot in 375 Winchester rifles. A couple years before I started making 38-55 ammo as Buffalo Bore Ammunition Company, I was shooting Marlin, Savage and Winchester 375 Winchester chambered rifles and was using good old every-day 38-55 brass in all of them. To be fair and give credit where it is due, it was both Brian Pearce and Mic McPherson that pointed out I could use common, readily available and affordable 38-55 brass to make full power 375 Winchester loads. I’ve been doing it for almost 20 years now and have not overlooked anything. If I sound jaded on this subject, it is because I am. Trying to convince folks of anything new, can be a futile attempt, so I am publishing this short text on our site and those who choose to believe me are invited to and we would love to sell you our excellent 38-55 ammo for use in your 375 Winchester or your 38-55. You will love how it performs and you’ll be glad you found a source of high-quality high-performance ammo for your 375 Winchester. 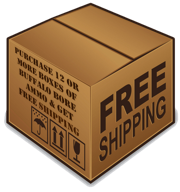 As a customer, we owe you this type of high-quality ammo and this type of time conserving straight talk. In our 17 years of doing business as Buffalo Bore Ammunition, many thousands of 375 Winchester chambered rifles have gobbled this ammo up and I’ve not had even one complaint, which I cannot say for all of our ammo. We use a bullet that is sized .377 inch. I am aware that 375 Winchester chambered rifles utilize a .375 inch bore. When fired, the .377 inch bullet will slug/size right down to .375 without raising pressures (we’ve tested the heck out of this) this is in part due to the construction of the bullet, but also due to our powder choice. We are also aware that many old 38-55 rifles utilize a bore diameter of up to .381 inch, but most are between .377 and .380 inch. At 38,000 cup, there is enough pressure generated by this cartridge to cause that .377 diameter bullet to hit the rifling lands and slug up to the bore diameter (all the way up to .381 inch) and give wonderful accuracy. We’ve considered making hard cast loads for 38-55 also, (I personally shoot hard cast 270gr. bullets in all of my several 38-55 rifles) but they are too hard to slug up when fired, so the user would have to know his bore diameter and because of this and the numerous questions it would generate, I am still holding off on making any hard cast loads. Further, when firing hard cast loads, they are also too hard to size down to a smaller bore diameter without raising pressures and the thought of a customer trying to shoot a .380 inch hard bullet down the .375 inch bore of a 375 Winchester, has me a bit nervous. So to date, hard cast loads for the 38-55 are not in production and may never be. If you email me and ask if what I wrote here is true, I will simply refer you back to everything I wrote here…..I will not tell you something more or different than what I have put in writing here on the site. What is written here is based on decades of my experience with my own rifles and with selling hundreds of thousands of rounds of this ammo to the shooting public…… Thank you for carefully reading this information. Good shooting and God bless. Ps As an aside, because I love the utility of the 38-55 when loaded to full power, I’ll include the following; I own one of each of the Winchester 38-55 commemorative rifles…..Winchester made three different commemoratives. (Chief Crazy Horse, Legendary Frontiersmen, and the Oliver Winchester) These are very functional and highly accurate rifles. I did not care about their collectability, so I installed aperture sights and sling swivel studs and have used them quite a bit. With proper loads, these collectible rifles will shoot 1 MOA @ 100 yards, which is super impressive for lever action 1894 design rifles. If you run across any of these commemorative Winchesters, do not dismiss them as useless collectibles. They are pretty prevalent on the open market because folks do not know just how usable a rifle they are. Part of the great utility of the 38-55 is that with our full power loads, they are capable of taking any North American game including grizzly or large AK Yukon bull moose, but they generate only about 50% of the felt recoil (this is a guess based on how the recoil feels to me) of our full power 45-70 loads……just sayin. In my earlier email of 6-06-2018, I mentioned the great accuracy I had with this 'heavy' .38-55 Win. ammo' in my like-new Win. 94 'Big Bore' carbine in .375 Win. caliber. 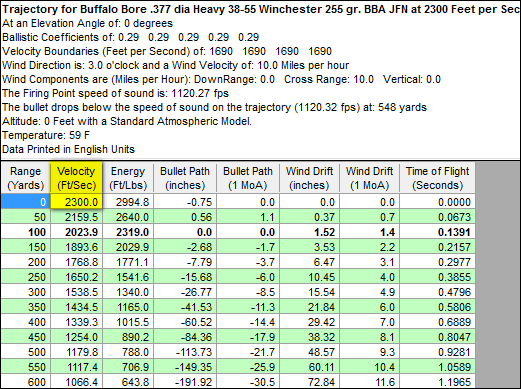 I finally chronographed the velocities that I was getting in my carbine's 20" barrel, and the average for the 20 shots recorded, has been 1961 fps, which is very consistent with Buffalo Bore's stated velocities! Accuracy, too, has been sub-2" groups at 100 yards, from a bench-rest, and using a Williams FP-94/375 receiver-sight. I couldn't ask for more except to ORDER MORE of this great load! I wrote a review a few months ago stating how accurate the 38/55 loads were in both my Winchester and Marlin. I have since shot 2 Texas bores both in the 200 lb range. Both fell in their tracks with one shot! I am heading out Elk hunting in a few weeks and plan to use this load. I received the 3 boxes of this ammunition that I ordered to use in my receiver-sighted, Winchester 'Big Bore' .375 Win. carbine. I had read that Buffalo Bore's 'Heavy .38-55' ammunition would an excellent fit 'power-wise'. I bench-tested the load in my carbine and got an initial 1-1/2", 5 shot group at 50 yds. I then zeroed the carbine at 100 yards and achieved (2) 5 shot groups that were no larger than 1-3/4"! This ammo' feeds and chambers beautifully and the .377 diameter, bonded-core 255 gr. jacketed-bullet, as loaded by Buffalo Bore wrings out the full capability of the .375 Win. cartridge in such .375/.38-55 rifles and carbines. My follow-on order to Buffalo Bore, for MORE of this great and powerful hunting ammunition, will soon arrive. Thanks. once again, to Buffalo Bore for their careful research in load-development, to give us loads that bring out the full potential of the old and new hunting calibers! Thanks, too, to Karen, their office manager, for her knowledge and prompt efforts in fulfilling our orders! You guys make a great team! I shoot the 255 gr load from my H&R target classic single shot. Excellent hog medicine when still hunting river bottoms. Excellent penetration from 10 yd to 150 yd. shoot 'em in the face, they drop with authority! I tested these using a 1893 Marlin and a 1894 Winchester both rifles shot groups under 1 1/2 inch at 50 yards. Can't wait to try this load on Texas hogs. Thanks for the great product. I used the fine 255gr JFN .38-55 load to take a nice Kentucky buck at sunrise yesterday. Shot was about 50 yards, full penetration and short death run by the buck. I saw it fall. It had proven to be very accurate in my Marlin chambered in .375 Win and I will continue to use this ammo for hunting in any of the four rifles I own in .375 Win. Shoots well in brand new Winchester 94 Trails End 38-55 rifle. Excellent and consitent accuracy with 3 boxes on the range. Using for this falls NY whitetail season. Feel very comfortable with this round for mule or whitetail.